It’s not every day that an engineer writes a thesis on handlooms. But Annapurna Mamidipudi, a 47-year-old engineer from Manipal, went to the Netherlands’ Maastricht University for a PhD in handloom weaving as sustainable socio-technology. Her thesis, “Towards A Theory Of Innovation In Handloom Weaving In India", was completed earlier this year. Mamidipudi is currently pursuing postdoctoral research at Maastricht University on responsible technology innovation for solving farmer problems in Punjab. But she hopes to re-engage with handlooms soon. It all began in Hyderabad, says Mamidipudi. When she moved there after marriage, she started working for Andhra handloom cooperatives in the early 1990s with Uzramma, the pioneer of Malkha (mulmul and Khadi) and co-founder of the non-profit Dastkar Andhra. “Uzramma inspired me and many other young professionals to work for craft, particularly handloom weaving." How did an engineer zero in on handloom weaving as a subject of research? The approach of the people who introduced me to this sector—Uzramma, Vinoo Kaley, Smarajit Ray—was one of problem solving through understanding both the social and the technical. But I had to unlearn many ideas when encountering technology in the hands of craftspeople. Here, the values were of a different kind of sustainability, with very little waste, and always combining with notions of beauty and utility. We had to learn to recognize science in the stories, to look beyond the manual labour to the skill. Values of productivity, efficiency and standardization had to be understood differently. We saw weavers who were technologists and innovators to the core, much more sustainable than many so-called modern technocrats, who had the ability to produce fabrics that consistently satisfied customers’ need for beauty and novelty. Yet, policymakers, and generally most of society, think of them as outdated and unsustainable objects of charity, or as traditional heritage to be museumized and brought out for special occasions. What they completely miss is the opportunity craft modes of production provide to save us from unsustainable production that is destroying the planet: a way forward to the future, rather than leftovers of the past. How does a shift from “vulnerability" to “sustainability" and then “stabilization" take place? There is a great value for change today; the newest technology is always better than the old. By default, we think that because handloom technology is old, it is outdated and unsustainable. Yet sustainability is also always about stability. Instead of assuming that handloom weavers are inherently unsustainable, can we think of them as being vulnerable? When vulnerable weavers are prey to fluctuating and exploitative markets, the outcome is unsustainability of livelihoods. On the other hand, weavers who are part of equitable marketing networks that value their products have a trajectory that leads from vulnerability to sustainability, rather than to unsustainability and migration. In such a situation, weavers are able to innovate and stay ahead of markets—not just of their products, but also their technologies. This reminds us that for weavers change is normal: The most common question they have to respond to when meeting customers is, “Show me something new!" So while it sounds like a contradiction, what weavers do very well is to innovate for stability. How can you marry innovation and craft? The separation between tradition and innovation is an artificial one, particularly in craft production. Yes, we have traditional crafts, but they could not have survived if they did not innovate. It becomes easier when you start thinking of handloom weaving as technology that has been able to constantly evolve to suit the changing needs of society. As an engineer, I thought technology was very dynamic, and culture was static. We make this division in our mind, but increasingly it is becoming clear that our traditional craft culture is also a technology, and our modern technology is culture too. But we need wisdom or, at least, social theory to help us understand how to reconcile older ideas of culture and technology with social reality today. Can technology innovation check the practice of middlemen pocketing the profit? The unregulated nature of the sector comes from insufficient investment in handloom institutions. The ones that sustain handloom weaving are the informal relations—in weaver households, between families, of caste, with the master-weavers, with patrons. Where the sector needs formal institutions in today’s world—say, for credit, branding, trading, marketing, legal protection from power-loom imitations, research—the lack of them makes the weaver vulnerable. People who buy from weavers—particularly master-weavers, middlemen—become powerful if they control information and trade. Cooperatives in Andhra Pradesh and Telangana do the same but with more sense of duty. NGOs contribute by linking to customers who believe in social justice and environmental sustainability—creating ethical markets. Interestingly, where there are active and well-working cooperatives and NGOs, then master-weavers and middlemen too become more equitable. Every time you ask, “why is this so expensive", when buying from small producers, you are yourself becoming part of the system that works to drive prices down. Usually, customers do this because they do not know the value of what they are buying, what is the “quality" that they are paying for, and weavers sometimes don’t know how best to make the argument that will communicate to the urban buyer. If we had the knowledge about how the product we buy is made, knew the person making it, we would probably make different choices. The intention matters; if enough people care about it, generally markets and technology will follow. Farmer suicides have begun making headlines but the decrease in number of weaving households and the increasing number of weaver suicides aren’t. Why is that? I would look at craft production versus industrial mass production for an answer, rather than farmer versus weaver. Small farmers and weavers, when forced into mechanized production for increasing productivity, become much more vulnerable to the market. This kind of instability over time leads to fatigue and, after repeated failures, to despair. Yet, it is the farmer who bears the brunt, is called unsustainable, and takes his or her life. It requires imagination and effort to come up with sustainable solutions, rather than go along with a system even though we suspect it doesn’t really work. And instead of giving headline space to social workers as people, (it is better to) resource our solutions, engage and pay attention to them. That is better for us, and for the constituency we represent. Rather than turning us into celebrity-seeking socialites, and then tearing us down, making us look like ineffectual buffoons because we didn’t live up to those expectations and solve the world’s problems, it would be great to amplify our ideas and work. Can corporatization revive the flickering handloom industry? We live in interesting times—in a world where the state is the market, and the corporate is having to wear a social face. Corporates have skills of scaling—but they are new to social justice, and have bad habits of putting financial bottom lines over the environmental. So, yes, I think the handloom industry may yet have answers for corporates. Handloom weavers can be the opportunity that corporates need, to learn how to revive their flickering ethics and reputations. If, indeed, handloom is a flickering industry, then its potential as green technology that can reduce carbon footprints and sustain production, as a social system that connects us as producers and consumers to our customs, cultural history and land, as a financial system that offers equity to poor producers and quality to consumers, all these also become flickering possibilities, and that is a cause for concern. You dedicate an entire section to the Uppada Jamdani as an instance of innovation in weaving. Said to be of East Indian (now Bangladesh) origin, where temperatures are high and the climate humid, the Jamdani sari is a fine and delicate length of handwoven cotton fabric, embellished with beautiful flowery motifs in gold, silver or silk yarn. It was during the Mughal period that these flowery or figured muslins came to be known as Jamdani; the patterns were clearly Persian. 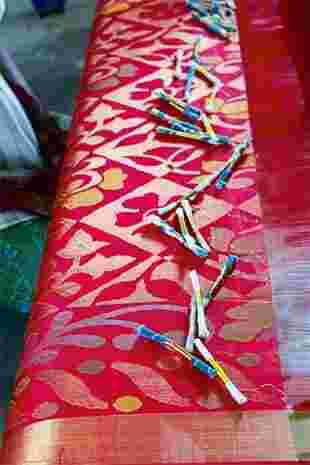 The traditional Jamdani technique is similar to that of tapestry, where small shuttles of coloured or metallic thread produce tiny motifs. Contemporary Jamdani, almost 2,000 years later, woven in and around Uppada (in Andhra Pradesh) combines this technique with computer-aided design to produce large floral patterns that repeat all over the sari. Jamdani has always been associated with luxury and beauty. It brings to mind an economy of plenty and prosperity, where weavers would be rewarded for working at a slower pace, when markets would value such labour and pay for it, generously. But in Uppada it became a solution for a crisis when rising yarn prices were driving weaver wages down. It seemed logical that weavers would then have to increase productivity of the loom to make up the loss in wages. This is what the state was suggesting that weavers do, with the policy recommendation towards mechanizing the loom. But the solution that weavers came up with in Uppada countered this idea. If yarn prices were up, then they would use less yarn, increase the amount of work they put into the warp, learn more intricate skills, and attempt to carve out a share of the market for luxury products. In essence, they used an older technique that was slower, rather than new ones that speeded up production. This was innovation that went backwards on the productivity and efficiency scale, but forwards on the scale towards beauty and quality. Weavers were able to do this by innovating the computer as a tool to speed up the digital computing of all the calculative functions in weaving Jamdani. I had seen weavers choose—not productivity over beauty, or tradition over modernity, or even market over heritage, but, consistently, a balance between the two. In the case of the digital Jamdani, the computer and loom didn’t compete; they worked together. This was how weavers reinvented Jamdani weaving and turned the crisis in yarn price into an innovation that sustained thousands of weavers in the Uppada region.